Please note that visits may be subject to changes. Windsor Castle is the oldest and largest inhabited castle in the world. It has been the family home of British kings and queens for almost 1,000 years. It is an official residence of Her Majesty The Queen, whose standard flies from the Round Tower when she is in residence. Windsor is still very much a working royal palace. The Castle is used regularly for ceremonial and State occasions. It is here that The Queen often hosts State Visits from overseas monarchs and presidents. St George’s Hall makes a spectacular setting for a State Banquet, when a single table, stretching the length of the hall and seating 160 people, is decorated with porcelain, and silver-gilt from the Royal Collection. Hampton Courtis the story of two palaces: a Tudor palace, magnificently developed by Cardinal Wolsey and later Henry VIII, alongside a baroque palace built by William III and Mary II. ‘It is one of the largest and best preserved Tudor palaces in the world, and boasts more than 1,000 rooms – including the largest surviving Great Hall in the country. The palace has witnessed some of the most significant events in British history, many of them associated with Henry VIII and his six wives. "One of Britain's finest eighteenth-century houses..."
'A visitor attraction since it was built in the 18th century, Stowe is one of the greatest and most imitated estates in Europe and has welcomed many literary, political and influential people as well as royalty. ‘No.1 Royal Crescent is a Georgian town house that creates a wonderfully vital picture of life in Georgian Bath. Built between 1767 and 1774 to the designs of the architect John Wood the Younger, the Royal Crescent is justly considered one of the finest achievements of 18th century urban architecture and represents the highest point of Palladian architecture in Bath. No.1 was the first house to be built in the Crescent and originally provided luxury accommodation for the aristocratic visitors who came to take the waters and enjoy the social season. Apsley House stands on Hyde Park Corner, the London home of the first Duke of Wellington and has changed very little since his victory at Waterloo in 1815. Built by Robert Adam in the 1770s it was transformed in the 1820s by the architect Benjamin Dean Wyatt. It has one of the finest art collections in London, with paintings by Velazquez and Rubens, as well as a superb collection of silver and porcelain. It is still the London home of the 9th Duke of Wellington and managed by English Heritage since 2004. Josephine Oxley, Keeper of The Wellington Collection at Apsley House will be leading your session. The Palace of Holyroodhouse is the official residence of the Monarchy in Scotland. Founded as a monastery in 1128 at the end of the Royal Mile in Edinburgh, the Palace of Holyroodhouse is a very significant site in terms of Scottish history. Best known as the home of Mary, Queen of Scots, the Palace was the setting for many dramatic episodes in her short reign. Today the state apartments are used regularly by HM The Queen. We will explore the 14 magnificent historic and state apartments, the romantic ruins of the 12th-century Holyrood Abbey and the remarkable royal gardens. Mount Stuart is a 19th century country manor house with delightful gardens on the Isle of Bute. It was the ancestral home of the Marquess of Bute, and marries magnificent Victorian Gothic architecture and design with contemporary craftsmanship. The 3rd Marquess – the greatest architectural patron of his day – and his architect Sir Robert Rowand Anderson created this extravagant house, fusing powerful architecture with noble themes and lavish designs. Like the Marquess, this sandstone palace is profoundly inspired by history, astrology, art and mythology. Alnwick Castle, one of the largest inhabited castles in the UK, it has been home to the Duke of Northumberland’s family, the Percys, for over 700 years. Combining magnificent medieval architecture with Italianate state rooms, it is a northern treasure house. The property features as the magnificent Brancaster Castle in Downton Abbey, and was the setting for Hogwarts School of Witchcraft and Wizardry in the Harry Potter films. 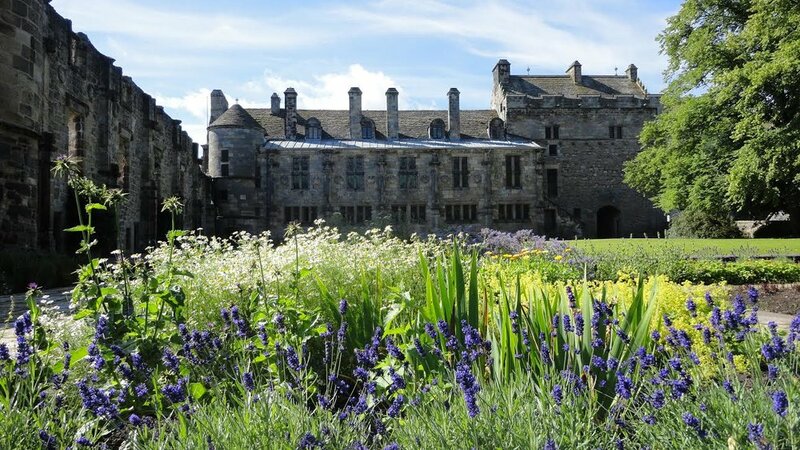 The royal Palace of Falkland was used as a country residence by Stuart kings and queens. Mary Queen of Scots went hunting and hawking around the woods and park, which is still beautifully maintained today. The palace was built between 1501 and 1541, but fell into ruin from the late 17th to early 19th centuries after it was burnt by Cromwellian troops. In the 1880s it was bought and restored by the wealthy 3rd Marquess of Bute and his descendants still live in the Palace today, having given the National Trust for Scotland the role of Deputy Keeper in the 1950s. Both the original and reconstructed rooms are packed with fine portraits of the Stuart monarchs, 17th-century Flemish tapestries, elaborate painted ceilings and antique furnishings.